GENERAL Brian Peddle has now taken office as The Salvation Army's 21st international leader, succeeding General André Cox, who has retired. He is joined in leading the global Salvation Army by Commissioner Rosalie Peddle (World President of Women's Ministries). The General and Commissioner Peddle are Salvation Army officers of the Canada and Bermuda Territory, originating from the province of Newfoundland. The General was a cadet of the Companions of Christ Session (1975-1977) and Commissioner Peddle the Overcomers Session (1974-1976). After marrying in 1978, they shared ministry in various appointments in corps, divisional headquarters and training college in their homeland of Canada. Their first international service came in 2007 when the then-Majors Peddle were appointed to the Northern Division of the New Zealand, Fiji and Tonga Territory. Promotion to colonel and a change of country came in 2009 as the Peddles were appointed as Chief Secretary and Territorial Secretary for Women’s Ministries in the United Kingdom Territory with the Republic of Ireland. July 2011 provided an opportunity to return to Canada, as territorial leaders. Commissioner Brian Peddle was appointed as Territorial Commander, and Commissioner Rosalie held simultaneous appointments as Territorial President of Women’s Ministries and Territorial Secretary for Spiritual Life Development. A first opportunity to serve at International Headquarters (IHQ) came in September 2014, with Commissioner Brian Peddle appointed as International Secretary for the Americas and Caribbean Zone and Commissioner Rosalie as Zonal Secretary for Women’s Ministries. On 1 November 2015 Commissioner Brian Peddle was appointed as Chief of the Staff, with Commissioner Rosalie serving as World Secretary for Women’s Ministries. Such international service has helped prepare them for the international leadership of The Salvation Army. Commissioner Peddle received a BA in Biblical and Theological Studies in October 2007 from the William and Catherine Booth Bible College in Winnipeg, Canada. Both the General and Commissioner Peddle are graduates of The Salvation Army’s Executive Leadership Programme from Simon Fraser University in Canada. Outside of their ministry, the international leaders have a variety of interests. The General enjoys kayaking, cycling, hiking and fishing, while Commissioner Peddle enjoys reading, cycling and hiking. Personal conversation with family and friends remains a priority, even in the midst of busy lives. Fuelled by their conviction that God continues to use The Salvation Army to impact our world, the General and Commissioner Peddle share a strong sense of calling as Salvation Army officers. They are convinced of their responsibility to preach the gospel, encourage the saints and serve those in need. 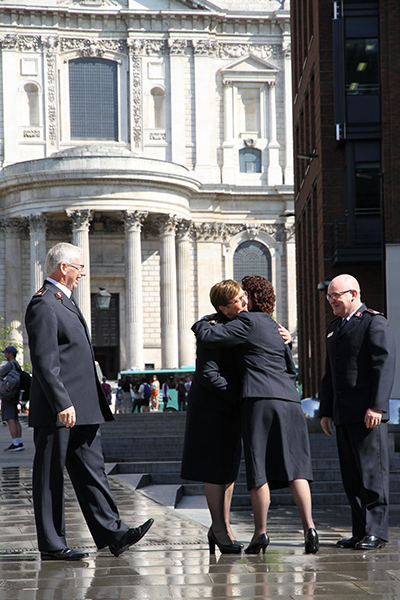 They fully embrace and celebrate the diversity of The Salvation Army, while sensing deeply the joy of leading an international Army that is unified through its calling to mission. The General and Commissioner Peddle have two daughters, Stephanie and Krista. Stephanie and her husband, Adam, are actively involved in the Sauble Christian Fellowship Community Church in Ontario. Krista and her husband, Tim, are Salvation Army officers, currently serving in Australia. The General and Commissioner Peddle are delighted to have five grandchildren. The IHQ welcome to the new international leaders will take place on Monday 6 August, and the public welcome – which will be live-streamed – will be held at William Booth College, London, on 23 September. Salvationists and friends around the world are asked to support their leaders in prayer now and in the coming days.